In 1643 Margaret Van der Schure (Jasper) married (Admiral Sir) William Penn (1621-1670). Seven years later, c1650, Margaret Penn’s sister, Anne, married Captain William Crispin. Like the Penn family, William Crispin (c1610-1681/2) was a merchant; captaining his own ship as he plied international trade, including importing wool from Holland. During the period of the English Revolution (1640-49) he was a ship’s purser on a number of vessels. He is also reported as being a soldier under Cromwell and rose to be Captain of the Guard. In 1652, during the Commonwealth period, he was appointed command of the Hope. Like Admiral Penn, Captain Crispin was in favour of the return of the Monarchy and conspired against the Cromwellian republican government. At the time of the Restoration he was living in the important, English-occupied, Irish port of Kinsale ~ probable to be near and work in association with Admiral Penn. He later lived in Kilrush, County Clare, in close association with Admiral Penn, for some 20 years. He may well have been an administrator of English ‘justice’ in the county ~ certainly he will have been awarded for his previous Royalist sympathies and activities. There is no mention that he became a Quaker while in Ireland – though it is an outside possibility. Captain Crispin died in Barbados en route to be a Commissioner in Pennsylvania (one of three originally appointed) which was the property of the Admiral’s son, the Quaker, William Penn. He was to work with William Penn’s cousin, William Markham, who was the Deputy-Govenor of the colony. Specifically the Commissioners were to negotiate with Native Americans for land to build the city of Philadelphia. “London, 18th 8th mo. 1681. “… I have sent my Cosen, William Crispin, to be thy Assistant, as by Commission will appear. His Skill, Experience, Industry & Integrity are well known to me, & perticulerly in court-keeping &c ; so that it is my will & pleasure that he be as Chief Justice, to keep the Seal, the Courts & Sessions ; & he shall be accountable to me for it. The proffits redounding are to his proper behoof. He will show thee my Instructions, which will guide you all in the business. The rest is left to your discretion ; that is, to thee, thy two Assistants & the Counsel. . . . Pray be very respectfull to my Cosen Crispin. He is a man my father had great confidence in and value for. . . . The Captain was one of the first purchasers of land in Pennsylvania – buying some 5,000 acres. When Crispin died Penn gifted these lands and the rights to city lots in Philadelphia to Crispin’s nine children. Following the death of her husband, Anne stayed in Ireland with her younger children for seven years. As relations, by marriage, to William Penn, the Crispins became involved in the establishment of the Pennsylvania colony ~ as landowners and administrators. When the history of Pennsylvania is written of, the origin of the wealth and influence of the Penn family is rarely acknowledged. This blog, in part, attempts to change that approach. 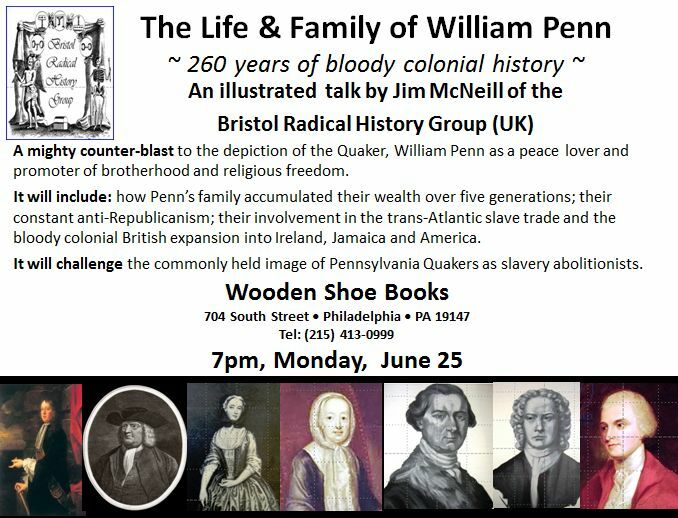 Below are a selection of slides from a talk I recently gave in Baltimore on William Penn, His Family & Irish Colonisation. 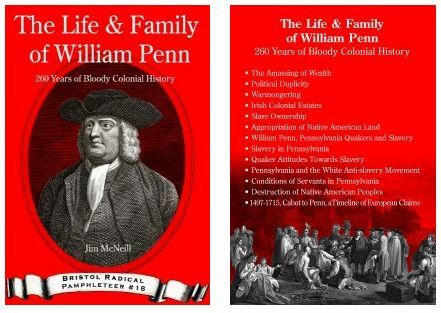 My reason for starting this blog results from a series of successful talks I delivered this summer in Philadelphia, New York and Baltimore entitled, “The Life & Family of William Penn ~ 260 years of bloody colonialism’. 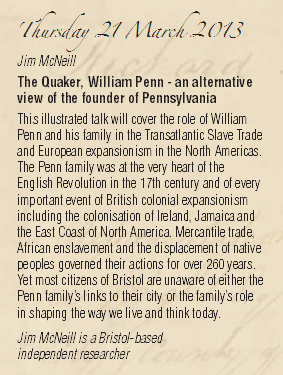 The purpose of the talks were, in part, to promote a newly published booklet of the same name by the UK-based ‘Bristol Radical History Group’. This 32-page, illustrated booklet is available on-line from Tangent Books or you can buy straight over the counter from Bristol’s latest bookshop/cafe, Hydra Books. 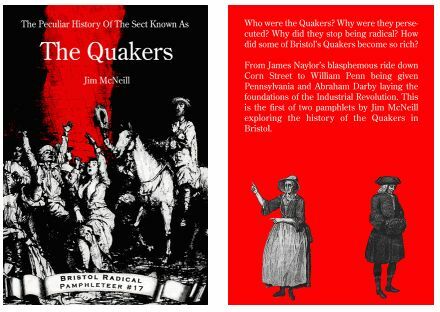 The above booklet follows on from a previous one by myself: The Peculiar History Of The Sect Known As The Quakers. Full details are available here.